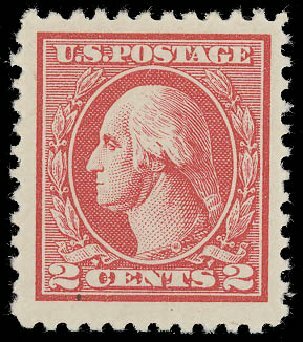 1918, 2¢ carmine Offset, type VI (Scott 528A), o.g., never hinged, huge margined example of this difficult type VI offset issue, with breathtaking color, Very Fine to Extremely Fine, with 2001 P.S.E. 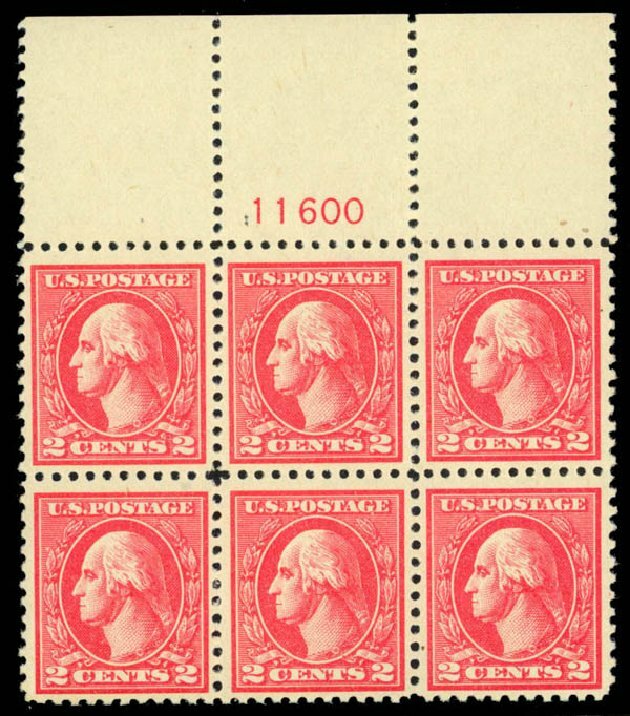 certificate for block of six from which it came, lower left stamp. Scott $115. Estimate price $150 – 200. 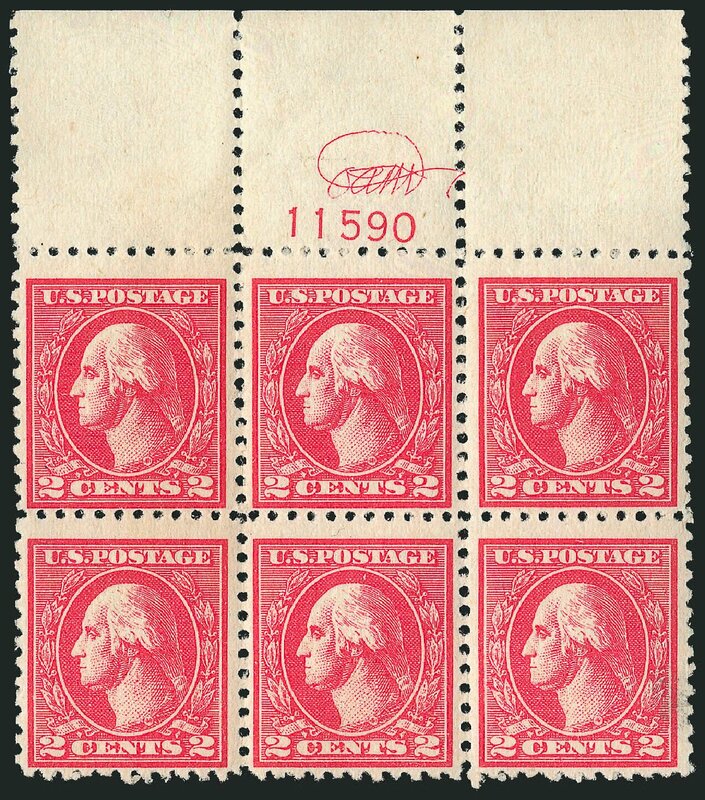 1918, 2¢ carmine Offset, type VI (Scott 528A), top margin plate block of 6, o.g., never hinged, brilliant fresh color, a desirable full wide top, Fine. Scott $800. Estimate value $250 – 350. 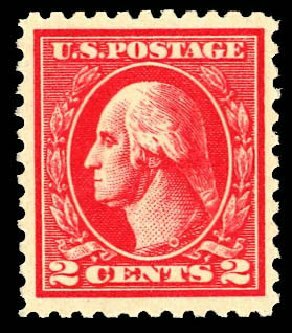 USA (Scott 528Ad) 1920 WASHINGTON 2? 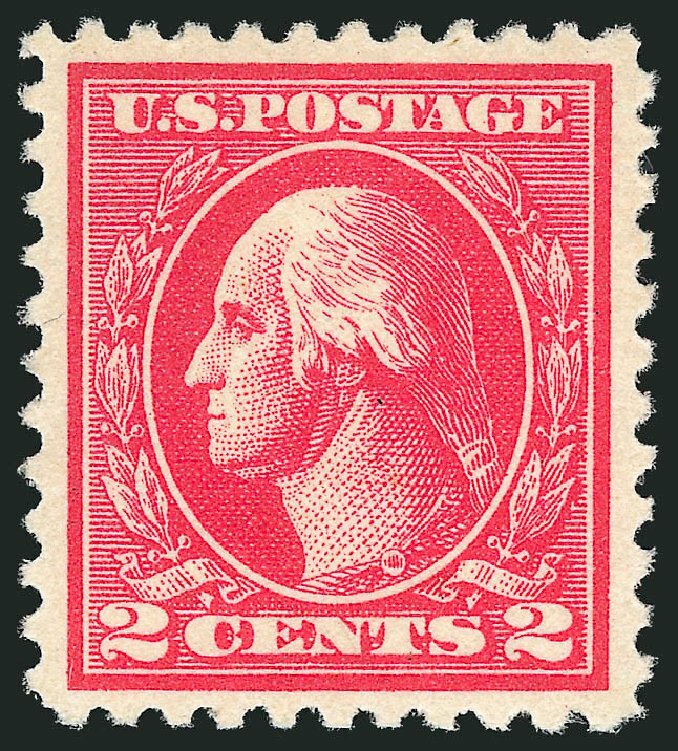 CARMINE TYPE Va, DOUBLE IMPRESSION Very fine centering (for both impressions!) with very clear second image. Original gum, previously hinged, although very lightly so. 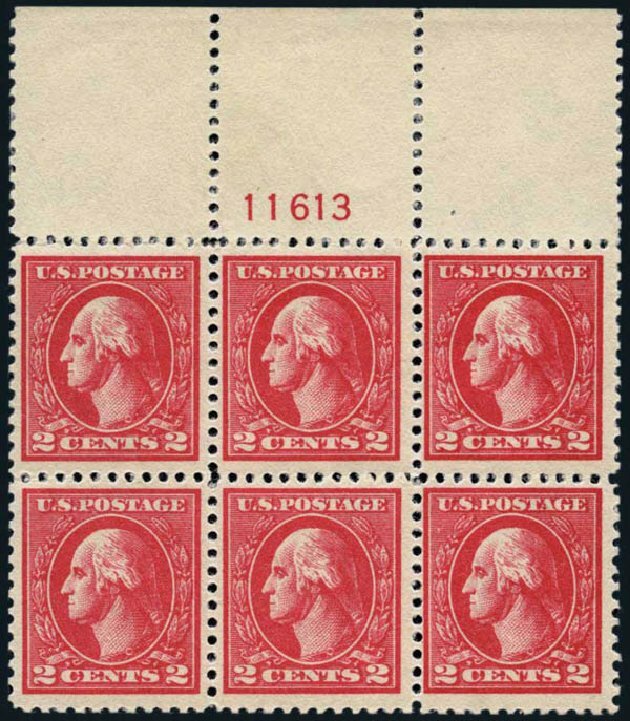 (2006 PF Cert #440579, for irregular block, of which this is upper right stamp) Cat $180. 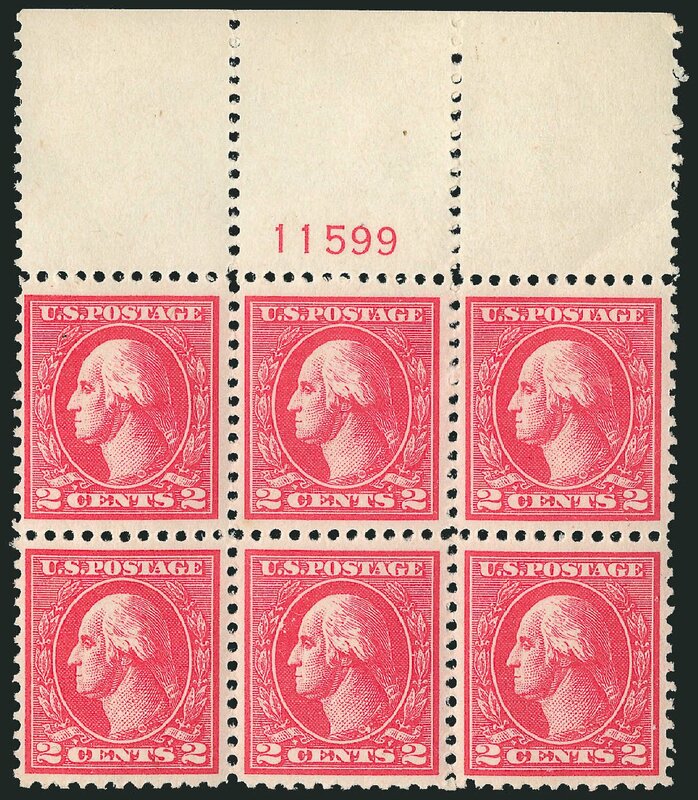 U.S.; General Issues, 1918, 2¢ Carmine Offset, Type VI, Plate Block of 6, #528A. N.h., large top #11613, Fine to Very Fine, PF (2013) cert. Scott $800. Estimate price $250-300. 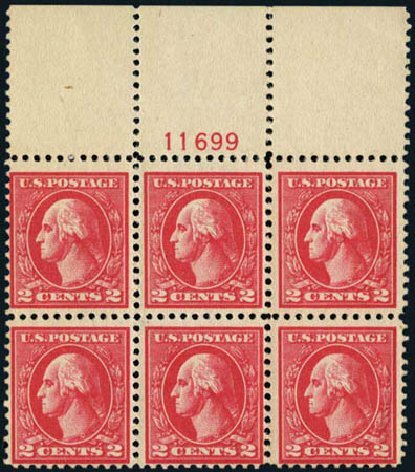 U.S.; General Issues, 1918, 2¢ Carmine Offset, Type VI, Plate Block of 6, #528A. N.h., large side #11606, Fine to Very Fine, PF (2010) cert. Scott $800. Estimate value $200-250. 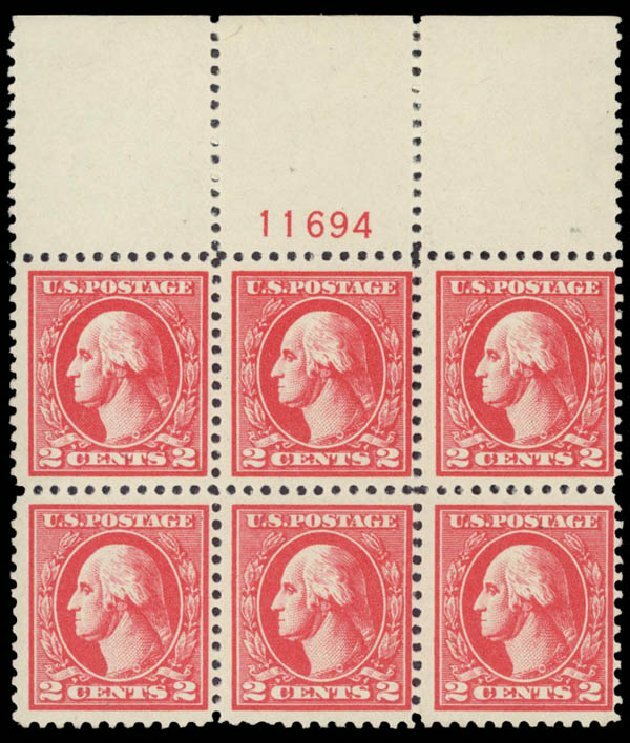 Scott #528A, 2c Carmine offset, Ty. 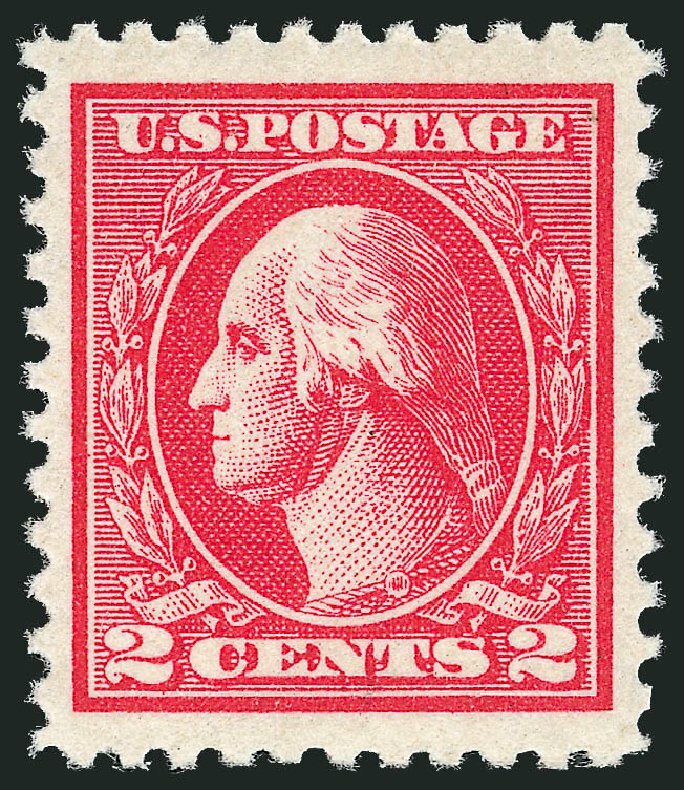 VI, lovely mint example of a stamp which is seldom found this nice, brilliantly fresh with intense color, huge margins all around and being beautiful centered within them, pristine o.g., never hinged, extremely fine. 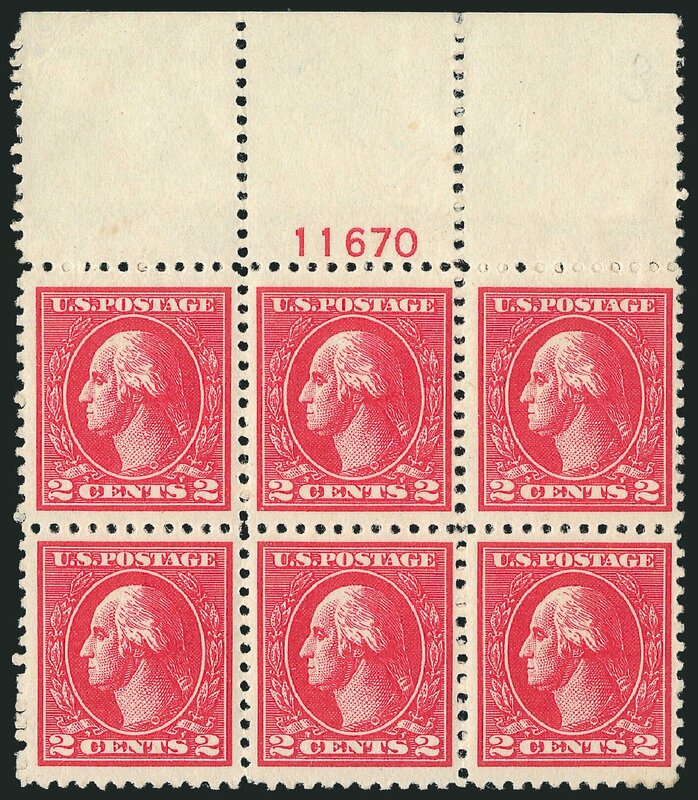 U.S.; General Issues, 1918, 2¢ carmine offset, type VI, plate block of 6, #528A. O.g., top #11699, hinged selvage, Fine. Scott $425. Estimate $120. 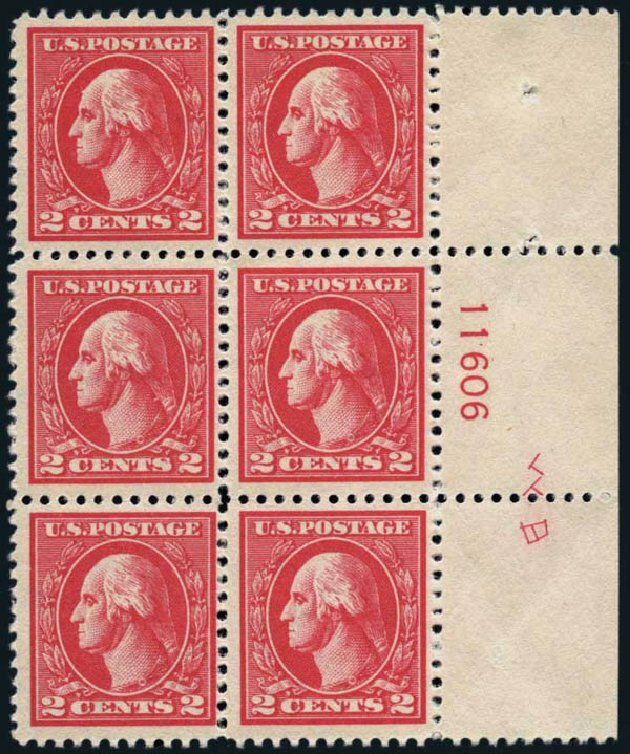 1918, 2¢ carmine Offset, type VI (Scott 528A), top plate block of 6, o.g., never hinged, one of the freshest and choicest examples we have had the pleasure to offer, being a spectacular wide top with immaculate unblemished gum – without a single skip or bend, a true condition rarity worth a serious bid, Very Fine. Scott $800. Estimate value $600 – 800. 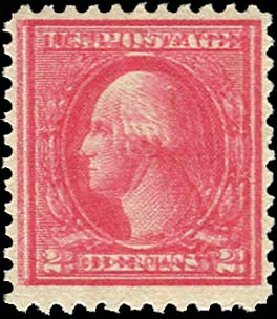 1918, 2¢ carmine Offset, type VI (Scott 528A), top plate number single, o.g., never hinged, wonderfully fresh example with sharp clear impression, Very Fine. Scott $115. Estimate value $100 – 150. 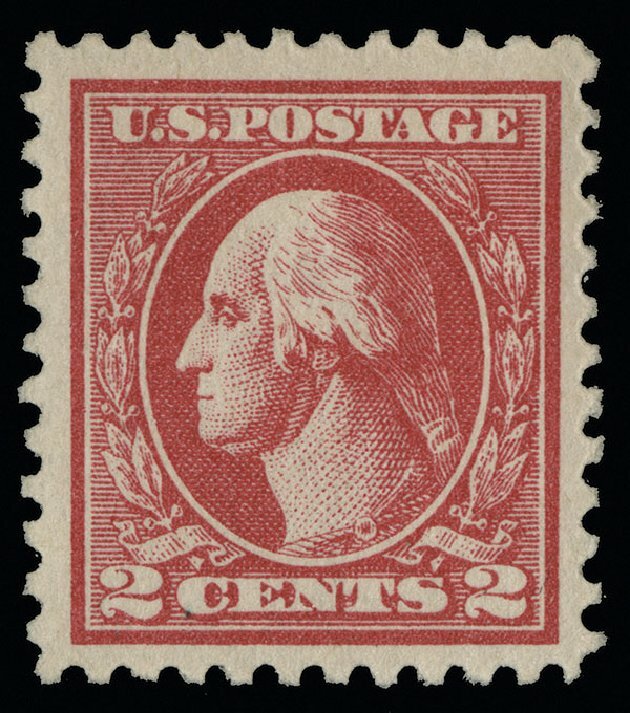 1918, 2¢ carmine Offset, type VI (Scott 528A), o.g., never hinged, nice big margins and deep rich color, a great copy of this tough type VI stamp, Extremely Fine. Scott $115. Estimate $200 – 300.